Luton fans needn’t worry that the club’s next manager will start tampering with a winning formula according to one of the men charged with appointing the new chief, interim boss Mick Harford. The former Hatters supremo, who is taking temporary charge while a successor to Nathan Jones is appointed, will be heavily involved on who will lead the club forward. When asked he if was aware of fears that a new manager would rip things up and start again, despite Town being second in League One, Harford said: “I understand that, but I don’t think that will happen. “We’ll bring in the right type and whoever comes in will be allowed to manage. 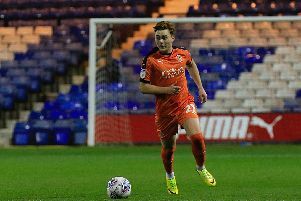 “When the last manager left, Nathan, everyone thought this is going to derail Luton Town Football Club, but let me tell you it won’t derail the football club. “We’ll carry on regardless, we’ll carry on relentlessly to get what we want. “The job is open to everyone, we’re looking everywhere. "We’ve had hundreds of applicants, all kinds of people, some you rule out, some you would never rule out, some surprise you, some don’t surprise you, but the job is open to everyone. “They will be given the opportunity to go through the interview process, in front of the board, in front of Gary and see where we are, we believe we’ll take as long as it takes, as long as we get the right man. Club captain Alan Sheehan wasn’t paying any attention to the worries either, keeping his mind totally focused on the job in hand. Speaking before the FA Cup tie with Sheffield Wednesday, he said: “I’m going to say that right now, all we have on our mind is Sheffield Wednesday in the cup, then Peterborough in the league, and then whatever happens, happens. “We have a system that really has been working for the last few years and we have the players that suit it. “Whoever gets the job, you’ll have to ask him what his ideas are, because we’re players, we have to look after the dressing room and keep everything right. “To be honest with you, that’s the last thing any of us care about really, what a manager does. It was the same response for centre half Sonny Bradley too, as he added: “There’s no concern as there’s no point worrying about something you can’t control. “If that does happen and the manager wants to come in and he sees a different way to play the game which would suit us, then we’ve just got to back him. Town chief executive Sweet is confident the next manager will be a good match for the club too, adding: “Everyone will have what they class as their own philosophy, but we need somebody that’s got an appropriate fit. “Each manager will have their own personal football characteristics in their way, but the dynamic of Luton Town has been there for decades. “Occasionally in our past, we’ve had to deviate slightly to get the job done, but actually we’re back to where our football culture has been for decades, going right back to the likes of Harry Haslam and David Pleat, and those great manager that showed us a huge amount of success.